For the past year, I’ve been following Travel Fashion Girl, an awesome website that satisfies my dual urges of wanderlust and organized packing. I particularly love the packing lists that are posted. Another tip I got from TFG is to use packing cubes to maximize suitcase space and maintain order. 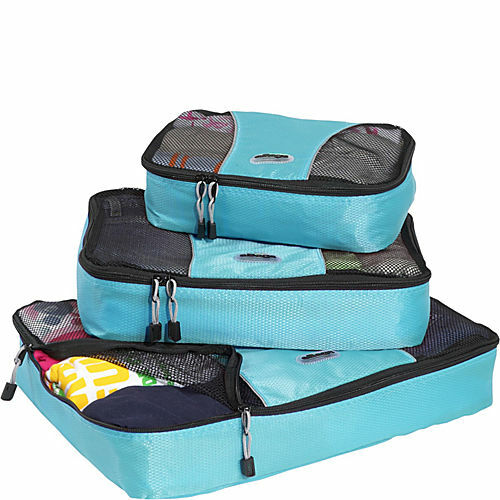 These particular packing cubes are from ebags, and a 3-piece set ranges from $15-30 depending on the size of the cubes. I ordered a slim cube set for our recent trip, and they worked great. Now I’m planning get more color-coded sets, one for each member of the family. No more scrounging around in the bottom of a messy suitcase for a 6 year old’s last pair of clean “Star Wars” underpants!